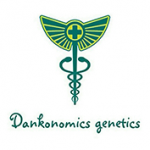 Dankonomics Genetics - Tooth Wreck. Free US delivery. Tooth Wreck is a cross of the legendary Californian marijuana strain Arcata Trainwreck and the Sweet Tooth #4 IBL, itself a cross of Sweet Pink Grapefruit and DJ Short's Blueberry indica-dominant plant. Good for cultivating in all growing environments this super-vigorous indica/sativa cannabis plant has a flowering time of between 6 - 10 weeks depending on whether the pheno-type exhibits more sativa or indica genetics, the indicas being that much faster to mature. Outdoors in northern latitudes harvest time will be either in late September or during October. Buds are compact and covered in a thick layer of resin making this a great strain from which to make your favourite extracts and concentrates. The range of flavours present in this weed strain includes pine, lime, mint, blueberry and candied grapefruit. THC production is very high ranging from 18% to 28% in the heaviest, most potent examples. Its effect is fast-acting and potent and tends more towards the sativa albeit with an indica kick like a mule. Therapeutically this cannabis strain is recommended for post traumatic stress disorder, anxiety, pain management, stress and for alleviating problems associated with the treatment of cancer via Rick Simpson Oil.